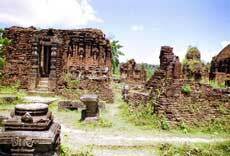 My Son was once the spiritual heart of the Kingdom of Champa that occupied what is now the central area of Vietnam for over a thousand years. The origins of the Cham are unclear, but it appears that they were an important element of the Indianisation of South East Asia around the first and second centuries AD. An important part of the culture of the various groups was the creation of massive temples and monuments, the quintessence of which was the amazing Angkor complex in Cambodia. The Chinese control of Vietnam was more or less contemporaneous with the Cham Kingdom. They tolerated its presence and used it as a source of income via tribute and, from time to time, plunder. However, once the Vietnamese had driven their oppressors back across the border, they turned their attentions southwards and began a long war of attrition that culminated in the demise of the kingdom and the assimilation of most of its people. the tower head (typically lotus shaped) represented the realm between the two worlds. The structures were usually built of baked bricks and sandstone. The builders of My Son derived their cultural and spiritual influences almost exclusively from India in the form of the trinity of Brahma, Vishnu and Shiva. Shiva was the central figure of worship – his images abound among what remains of the Cham monuments. The building techniques are less certain. The thin red bricks used in their construction indicate a very high level of skill. Various theories have been put forward to account for the unerring accuracy of the brickwork. One suggests that they were stuck together by some form of vegetable glue. Another proposes that the towers were erected with the bricks in a dried state and were fired in situ by piling wood against the edifice to create an enormous outdoor ‘kiln’. For anyone who has closely inspected the remarkable regularity of the joint and bonding courses, both seem unlikely explanations. Unfortunately, the US forces believed that My Son was a Viet Cong field headquarters (an assumption open to doubt). They therefore designated the site a free-fire zone resulting in heavy shelling and the destruction of many of the towers. The process of decay has continued since, and what remains is in a poor state of repair. The site’s designation as a UNESCO World Heritage Area has reinvigorated interest in its conservation and has already attracted significant resources to that end, notably from Italy. Despite its neglected appearance, My Son is worth a visit. It is in an attractive valley, well away from any other buildings, in the mists of a wooded area. It’s usually quiet, peaceful, and very evocative. Even in their ruined state, the towers are impressive, and the scale of the endeavour makes its religious significance obvious. If you visit the site, remember to take sunscreen because the valley is a sun trap, and if you see anyone climbing on the remains of the towers to take photographs, please remind them of their responsibility to help in its conservation!